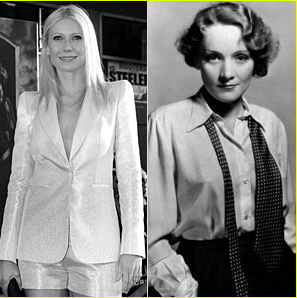 UMP | University of Minnesota Press Blog: What do you think: Gwyneth Paltrow as legendary actress Marlene Dietrich? What do you think: Gwyneth Paltrow as legendary actress Marlene Dietrich? In the past week, it has been sporadically reported that Gwyneth Paltrow has signed on to play legendary German actress Marlene Dietrich in a two-part biopic that will be the product of a collaboration between HBO, BBC, and EuropaCorp TV. What do you think about this matchup? Vote in the poll at the top of this page. University of Minnesota Press will be publishing Dietrich's biography by Steven Bach in February. As Dietrich's grandson, I can tell you that Steven, though a nice guy, was never a very good student (so said JvS) and there are so many factual errors in his so-called biography that one cannot help but discount most of his suppositions. Starting with my own life's details he cannot even do proper research based on newspaper and media reported dates, events and births - for example, my second son, Sean, was not her "1st great grandson" but 3 years earlier our 1st son Matthew was. Inexcusable errors like these point to very sloppy research and conjecture... none of which can be called good biographical foundation. makes the whole book suspect.